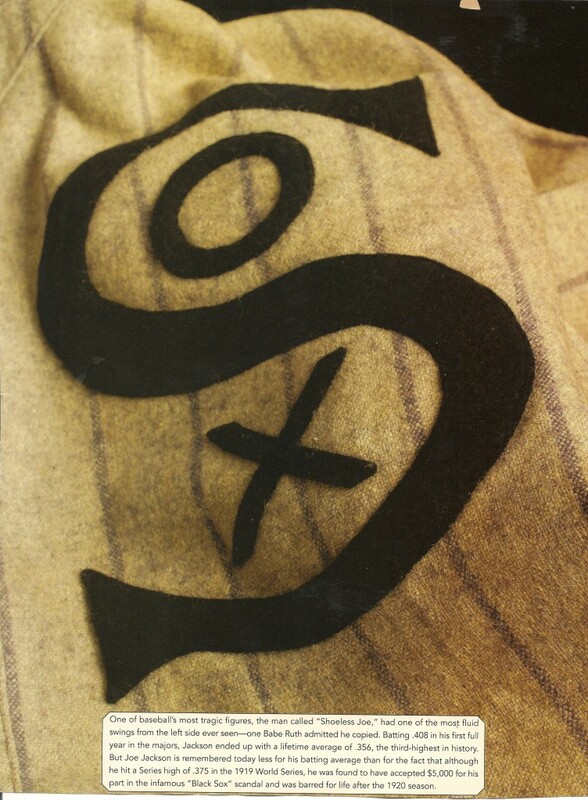 The Hall of Fame's counterfeit Joe Jackson jersey was featured in the 2009 coffee-table book, Bert Sugar's Baseball Hall of Fame (Running Press). Halper claimed to have acquired items from ”Shoeless Joe’s” widow in the 1950’s including: Jackson’s 1919 jersey; Jackson’s ”Black Betsy” bat; Jackson’s glove; and a 1919 Pennant gold pocket watch. However, the revelations this week by the Hall of Fame suggest that Halper may have intentionally defrauded both the Hall of Fame and Major League Baseball when he sold these dubious items in 1998 as part of a $7 million dollar transaction. The Chicago Sun Times reported that the bogus Joe Jackson jersey had been removed from the Hall of Fame’s White Sox exhibit in 2008, “to undergo more study when its authenticity came under question.” But the Hall of Fame provided the jersey to author Bert Sugar for his coffee-table book, Bert Sugar’s Baseball Hall of Fame (Running Press, 2009), which was released in May of 2009. When asked what he thought now about the Jackson jersey he’d included in his book, Sugar, from his home in Chappaqua, New York, said, “It ’s just not the real McCoy. I spoke to the Hall of Fame and we’re working on replacing that page in the book with another Jackson themed item.” Sugar added that he had the jersey photographed for inclusion in the book, “about a year and a half ago.” Sugar also said he viewed his book as a “virtual tour of the Cooperstown museum” and felt that replacing the Jackson page was important to maintain that experience for his readers. With the realization that their Jackson jersey is tainted, the Hall of Fame also recently removed from a museum display case an alleged Jackson glove from the Halper Collection. In addition, another key Halper item under scrutiny is Joe Jackson’s alleged “Black Betsy” bat. Several bats attributed to Jackson’s professional baseball career have sold at auction for hundreds of thousands of dollars, and Halper’s bat, purchased by MLB and the Hall of Fame, no doubt had a hefty price tag, too, especially if it was the alleged “Black Betsy” bat in his wife’s possession in the 1950’s. 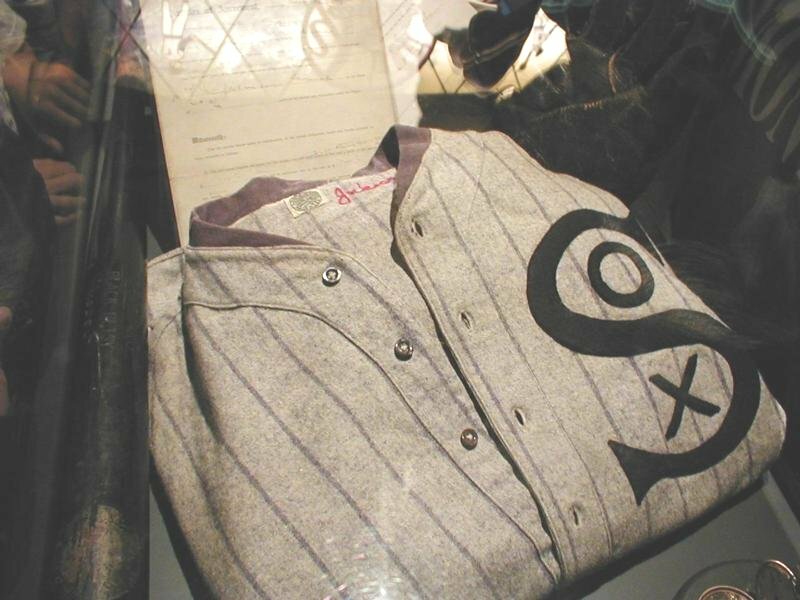 When the Barry Halper Gallery opened at the Hall of Fame in 1999, Halper’s ”Black Betsy” was displayed prominently in an exhibit case alongside the fake 1919 White Sox jersey. “Shoeless Joe’s” alleged “Black Betsy” has kept a curiously low profile at the Hall of Fame since its original display in the Halper Gallery in 1999, and has not been publicly displayed much in the decade since the Halper Collection purchase and donation. Hall of Fame spokesperson Brad Horn was unavailable for comment to confirm when Halper’s “Black Betsy” had been officially on display at the museum in Cooperstown. The Jackson model “Black Betsy” that Halper sold appears to be a Spalding store model with a decal affixed to the barrel of the bat. When asked his opinion on the bat, authenticator Troy Kinnunen of MEARS responded, “On a Spalding model bat like that one, which was readily available to the general public in the late teens, the value would be 100% based on the bat’s provenance. Without that, the bat would probably be worth anywhere between $400 and $1,000.” So, without Halper’s story of acquisition from Mrs. Jackson, its clear the Hall of Fame’s bat would lose hundreds of thousands of dollars in value if it doesn’t have iron- clad provenance. The next big question in the Halper-Jackson uniform scandal is what the Hall of Fame and Major League Baseball will do to recover the money lost as a result of the revelations that the jersey is a fake. The Hall of Fame’s 1998 Form 990 non-profit tax returns indicate that MLB contributed about $7 million in cash to the Hall of Fame to be used for the purchase of 175 items which they selected from the Halper Collection. MLB spokesman, Matt Bourne, said he did not know what the financial ramifications were for Baseball stating, “That took place so many years ago, I’m still checking into it.” When Bourne was asked if the office of MLB Security would open up their own investigation into the Halper scandal he stated, “I’ll have to check into that, too.” Barry Halper’s widow, Sharon, is currently a limited partner of the New York Yankees. With the inevitable financial ramifications of the purchase of Halper’s bogus material, the Baseball Hall of Fame, may come under further scrutiny by New York’s Attorney General since it operates as a non-profit public trust. The Hall of Fame learned last year that the Ty Cobb diary they purchased from Barry Halper was also a forgery, however, it appears they have never pursued reimbursement from Barry Halper’s estate. In the custody of the Hall of Fame, in a public trust, the bogus Cobb diary and Jackson jersey are owned by the people of the State of New York. It only makes sense that the State of New York would require restitution. In the aftermath of the Hall of Fame’s admission that the Joe Jackson jersey is illigitimate, how much they are owed is now the lingering question. 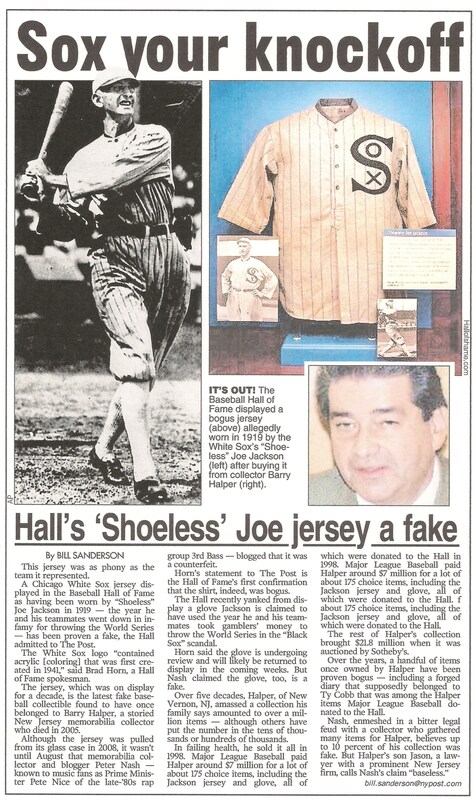 The NY POST, on Oct. 4, 2010, (above) reported that the Hall of Fame admiitted their Joe Jackson jersey was fraudulent. Glad to see the MSM finally reporting on this story… more to come, I’m sure. Maybe the most important information left out here is that The Hall of Fame did the authentication for items purchased from Halper not Halper. It sounds like they screwed up but it also sounds like Halper who isn’t even alive is now being blamed for the Hall of fame’s shoddy work and the Hall of Fame is now not taking responsibility that falls on whoever was in charge at the Hall of Fame or someone just wants to make halper who is not even alive look bad so the Hall of fame doesn’t look bad?/ comments? Even though the HOF should have done their own research, I still think they should be commended for admitting that this happened. I’m not sure they ever claimed they were authenticators. The biggest expert in the field at the time of the donation was Halper from what I read. It’s a lot more troubling that Halper lied to the HOF to make a million dollar sale, than it is that the HOF took him at his word. And not just on the Jackson jersey, but on the TY Cobb diary that was a forgery too. Kick’em in the grill, Pete. It seems many folks simply took Halper’s word without actually doing research. People need to re-examine every item that is sourced from the Halper Collection. Throughout his living years, Mr. Halper was never questioned about the authenticity of any of his items.